Like most antivirus software solutions, Bitdefender has two protection modes: "Active protection" is the real-time virus shield that examines web pages you visit, files you download, and files you transfer onto your PC / Mac from the network, or from a USB / external drive. Although you can temporarily disable that antivirus protection, you should probably never do it. 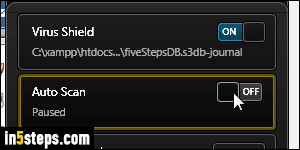 "Passive protection" are automatic background virus scans that Bitdefender periodically runs. Preliminary note: one reason I particularly like Bitdefender (Free edition or not) is that it is extremely efficient, and runs without noticeably affecting Windows or Mac OS X. Some antivirus software will bog down your system, making it sluggish. Since more protection is better, I'd recommend that you always leave Bitdefender's automatic background virus scans enabled! 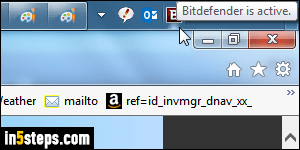 To disable virus scans, click on the Bitdefender icon near the system clock in the taskbar (click on the dropdown arrow button if that icon isn't visible in the tray). 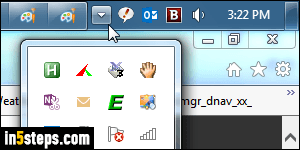 Tip: you can make Windows always show some hidden icons! 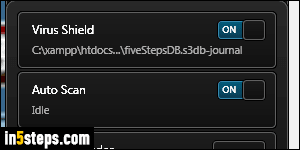 Click on the switch to disable scans: depending on your UAC settings, Windows will ask for the administrator's password. If not, make sure to change these settings to help Windows better protect you: if you get infected by a virus, it has the same permissions you do! UAC is your friend, albeit naggy at times : ) Once virus scans are disabled, the switch says OFF, with the word Paused instead of Idle. Remember to re-enable auto-scans as soon as you can!